I am always looking for easy, delicious, warm breakfast recipes. With the abundance of apples this one is right up my alley. I would have never thought of breakfast risotto, but let me tell you what. It hits the spot! Melt butter in large skillet over med-high heat. Add apples, cinnamon, allspice and salt. Cook and stir 3 to 5 minutes or until apples begin to release juices. Transfer to crock-pot. Add rice and stir to coat. Sprinkle brown sugar evenly over top of rice. Add apple juice and vanilla. Cover; cook on high setting 1 1/2 to 2 hours or until liquid is absorbed. 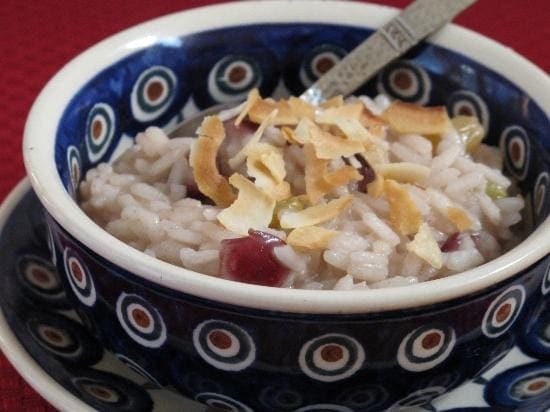 Ladle into bowls and serve with either dried cranberries,toasted coconut or sliced almonds if desired. You can use a non dairy margarine instead of butter to make this dairy free. Could I substitute no-sugar applesauce for the apples and/or some of the juice?